Sandesh is one of the oldest and popular Gujarati Newspaper founded in the year 1923.If you have any plans of booking ads in Sandesh newspaper you can do it by visiting any online newspaper ad booking agency.Now a days there are a number of ad agencies which help you in booking newspaper ads online. You can book Sandesh ads online at low rates,through our ad agency,book4ad. 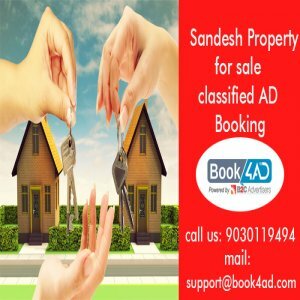 we help you in Sandesh property for sale classified ads booking in a hassle free manner. Other than property you can book classified ads online for many other categories. We are the leading online ad booking agency,we shall help you to advertise in any popular newspaper of India. We help you through out your ad booking process. You Can go through our sample ads to get an idea of the ad matter.Our aim is to make advertising easy.You can have preview of your ad so that any changes can be made before the ad gets published. It has huge circulation and reach as compared to other leading newspapers. No need to rush to different publication offices as we provide you the convenience of publishing your ads at the comfort of your home or office where you can see the preview of your ad before it gets published. Book4ad.com saves your time and effort and makes your job easy to get your classified ads and display ads published in all national and regional Newspapers anywhere across India. Choose the Ad-Type-Classified ads,Classified Display ads or Display ads according to your requirement. Select the respective category from the listed options and draft your ad using ad samples as reference. Select the city from the dropdown menu and in the publications select Sandesh from the listed options or you can directly select Sandesh and for the editions. Check the offers and schedule your ad by choosing the required date in the calendar. After verifying all the details you can pay through our secured payment gateways online through Debit Cards, Credit Cards Net Banking or from any of the mobile wallet apps available from the list of options. Once the payment is done an auto generated invoice from book4ad confirming Sandesh online advertising order details will be sent to your registered email id. If you have any queries you can chat or call us at :9030119494.